Few years ago, I’ve managed to clear out my extremely messy garden. Often termed as ‘messy mini jungle’ but some friends, I decided to clean it up once and for all. If you are like me, having no prior experience in gardening and cannot differenciate plants from weeds, I want you to know that with determination and patience, you can do it too. After I cleared my garden, it brought smiles at the faces of my neighbors (or was it relief?). 1. Plan an area to work on each time. That makes the task less intimidating. Then afer finishing one area and doing it well, move on to the next. When you see the results of the first finished area, it will motivate you to continue. Whereas if you pull weeds from here and there, even though you have spent are few hours, the results are less noticable compared if you focus on one area. 2. Identify one area to place bulkier items all stuff like tree trunks and big branches. Before I started on my garden, tree trunks were here and there (we had to trim a few fruit trees to avoid having it growing too tall and hit the electric and phone wires)- and on top of tree trunks, there were weeds that my family members had earlier tried to pull out. What I did is to drag all the trunk and place it at one area as advised by my neighbor. 3. Get things like flower pots out of the walking path. Place flower pots at the side- all in one corner. 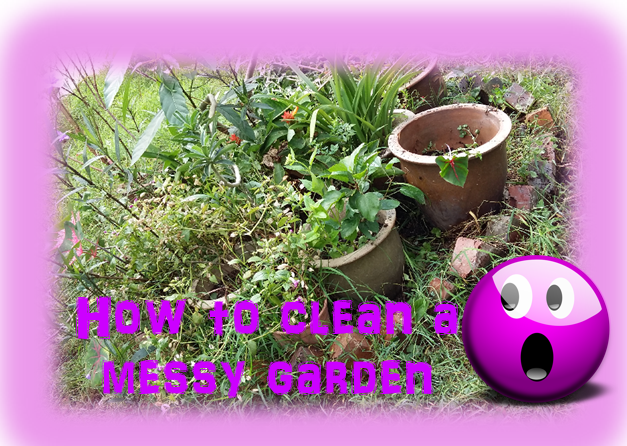 It clears out the space to make it easier for you to clear your garden. When buying flower pots, please do not buy plastic pots for outdoor use. Plastic pots are only good for indoor use as they are light and portable. But put them after the sun, they will crack after a while. I had to throw away a lot of plastic pots. RELATED: Should you maintain the garden yourself or outsource the work? 4. Pack dry leaves and weeds into garbage bags. Becareful not to have twigs or branches get into them because it will burst the bag. After filling up the bags, place them at one designated place (preferably protected from the rain). Focus on one area at a time as well. You can bundle the twigs in one place or place them in large containers so that it is easier to throw them away. 5. I find that the time when it is nearing nightfall has the most mosquitos. On hot days, mosquitos are less- I sometimes work around 10am and during afternoons, try to work in shadier area to avoid getting too much of sun. Also, wear thick long pants and shoes to avoid too much of mosquito bites. Thick wowen cloth gloves are best for pulling weeds. I am not sure about your area, but where I live, we are fortunate that the local municipal actually provide free service to remove garden refuse. So what I did was to clear everything and make arrangement for a lorry to come pick the things up. Find out from your neighbors who have gardens on how they get rid of their garden stuff. Worst case, hire a lorry to come over to throw all the stuff for you. After you are done clearing your garden, you can now focus on beautifying it by planting flowers or any of your favorite plants. But you must be realistic in your time availability to tend to your garden in future. 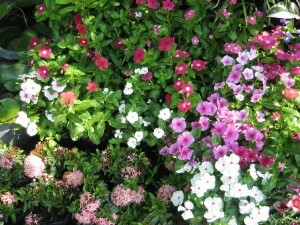 Plants need to be watered and if the weather gets too hot- well, you need to water them twice a day. If there is no one who can be dedicated to take care of the garden, do not get plants that grows easily or crawls (like money plant). Crawling plants look cute but with a bit of rain and your lack of time, your entire gate becomes infested out of control with them. Certain plants germinates easily and the population can grow out of control. Also, you may not want to get fruit trees that you may eventually need to pay a lot of money to have it chopped off because it grow too tall or huge. Even so, fruit trees shed a lot of leaves that needs to be constantly swept. Also, you may want to group your flowers in a circle or some kinda clump so that it is easier to water them (it’s easier to water in a circle than in a long row). Group similar flowers together so that they stand out clearly. If you group all kinds of flowers of different colours together, the overall effect is one of a cluttered mess. 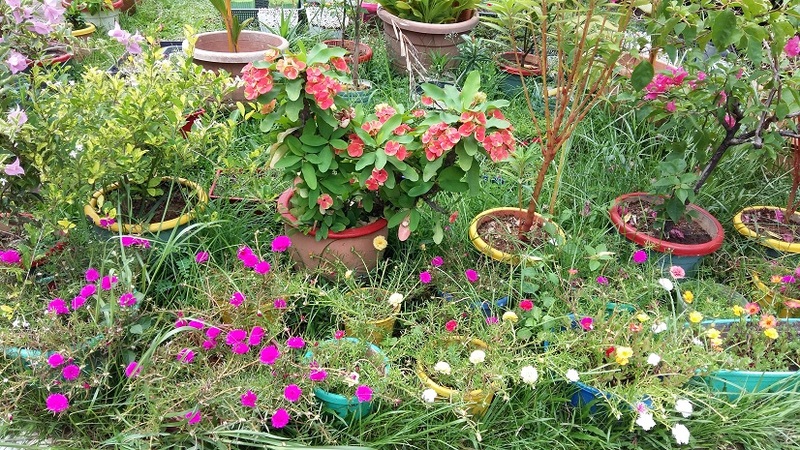 If you have earth, try to put your flowerpots on earth rather than tiles (unless you have no choice) because the soil from the flower pot that comes out when you water your plants can stain the tiles and you have to waste a lot of time, soap and water scrubbing your tiles. Even though you are new in organising your garden, you can figure out and get ideas from asking around. Folks will mostly only be too happy to share tips with you. You can also get a rough idea on garden design by driving around bigger houses with gardens and see how their gardens are designed or arranged. I agree with my neighbor that gardening can be very therapeutic and it actually relaxes you. I used to wish that I actually stay in an apartment so that I need to take care of the garden- but now, I realised that gardening can be a very rewarding and fulfilling hobby. RELATED: Should you have a real garden or replace it with concrete tiles?